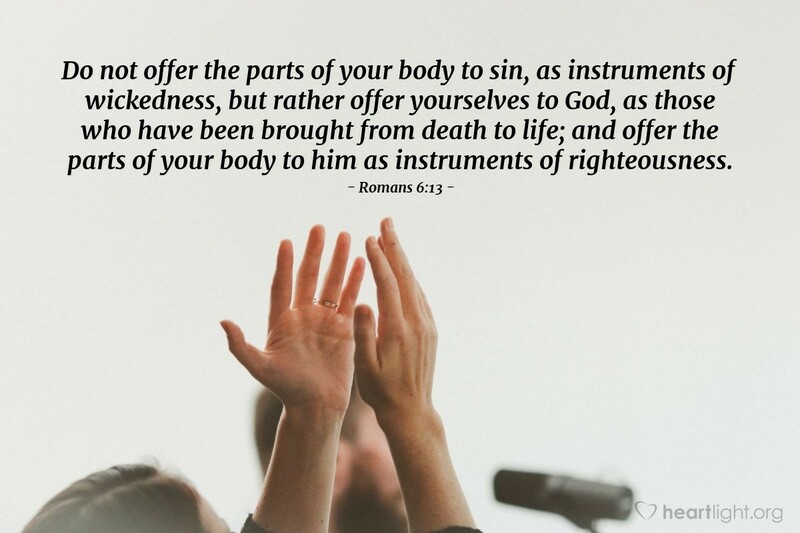 This long verse boils down to a very simple message: We are to glorify God by what we do with our bodies. We were dead in our sin, but God has made us alive through our participation with Jesus in his saving death, burial, and resurrection. How can we go back to the hideous sins that master us and lead us to death? We shouldn't! We mustn't! And by God's gracious help, we won't. Our commitment to live for his glory and the power of the Holy Spirit will help us live for him! Father, God of grace, please forgive me for the times in my past when I flirted with sin. I know how much you paid to redeem me from my sin. I know the power of Satan to use sin to entrap and enslave me. Bless me as I commit to live for you, with Jesus as my Lord, and the Spirit empowering me to honor you. In Jesus name. Amen.